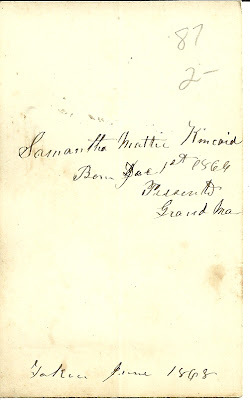 Cartes de Visite of two sisters, Eunice Verena and Samantha Mattie Kincaid, who were born in Minnesota and died in California. 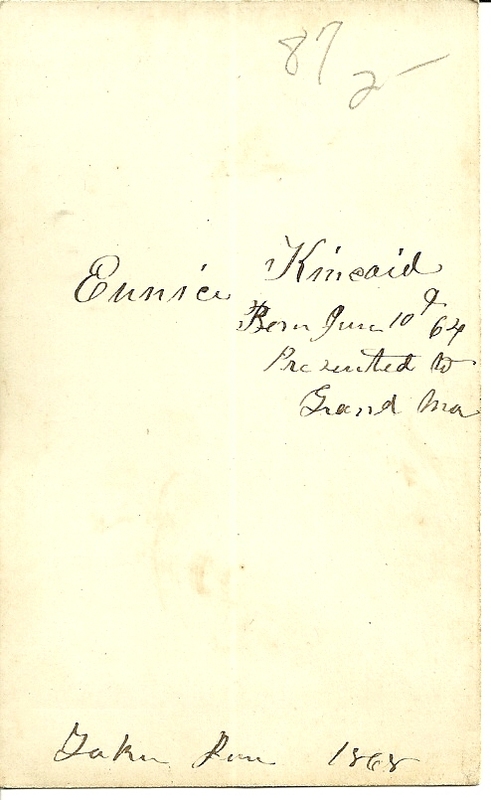 Above is Eunice Kincaid, who, according to information on the reverse of the CDV, was born 10 Jun 1864. The photograph was taken in 1868. Samantha Mattie Kincaid was born 1 December 1866. Eunice Verena Kincaid and Samantha Mattie Kincaid were the daughters of James Andrew Kincaid and his wife Mary Amanda (Bibbins) Kincaid. 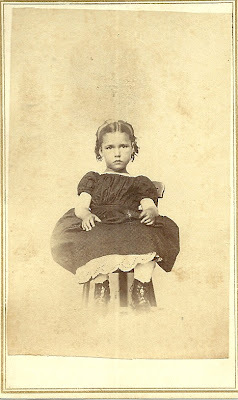 To see a tintype of the brother of Mary Amanda (Bibbins) Kincaid, check an earlier post: Julius Bibbins. Their paternal grandparents were Eucephius and Samantha (Pasco) Kincaid. 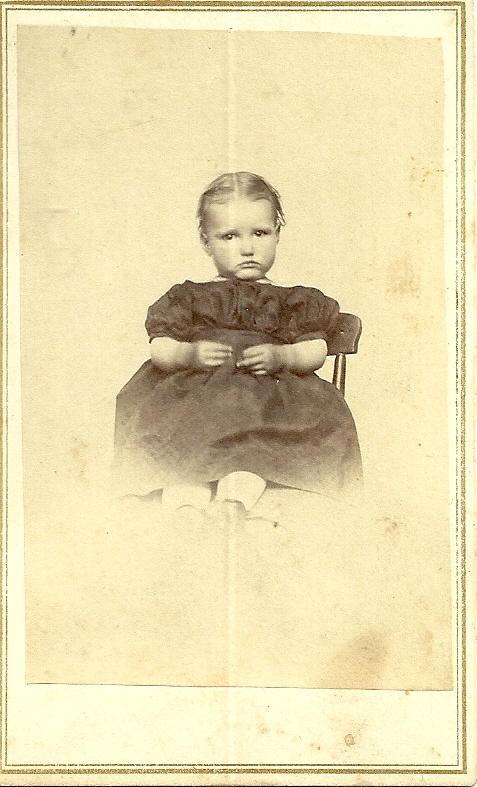 Their maternal grandparents were Eliphay and Laura W. (Hawley) Bibbins. 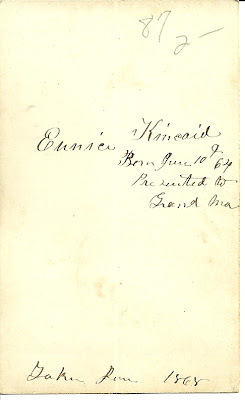 Eunice Verena Kincaid married Lemuel Lane Hotchkiss in California and raised a family of three children. Lemuel was born 7 April 1861 in California, the son of Burr Mallory Hotchkiss and his wife Anna Maria (Blowers) Hotchkiss. Thank you for posting the pictures of my great grandmother, Mattie and her sister. I am interested in learning where you found these CDVs. 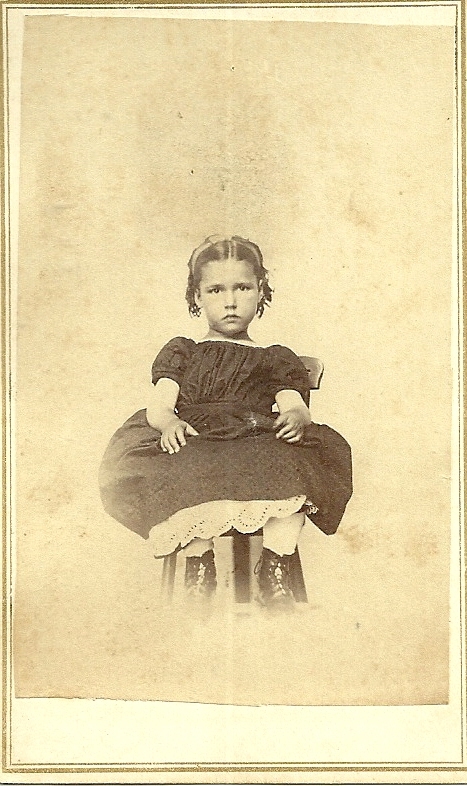 In our Clement family history and documents, my 2nd great grandmother's name is spelled Savilla (Clark) Clement. 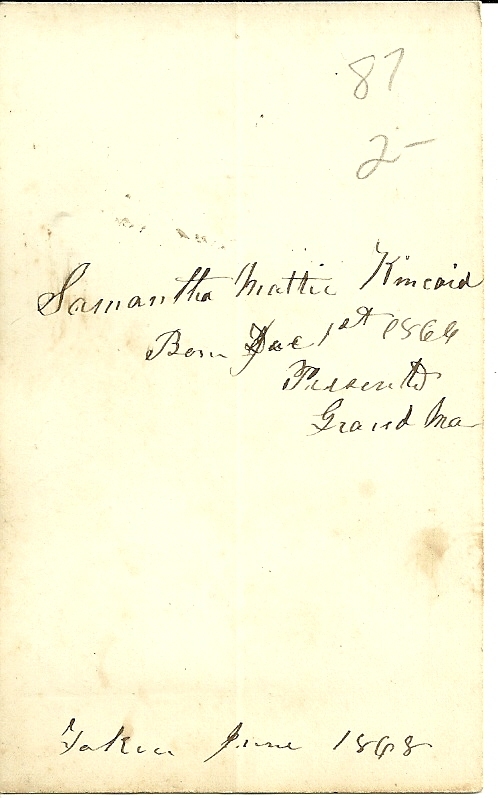 Thanks for taking the time to comment and for providing the correct spelling of your 2nd great grandmother's name. I noticed various possibilities online for the parents of her husband Isaac Roswell Clement. I probably bought these 4 photos (the Bibbins ones make 3 and 4)on eBay. Glad to introduce you to young Eunice and Samantha!